Your shoes are looking a little shabby after that recent 20-miler. Your favorite running outfit has seen better days. Your socks are causing more blisters than comfort on your feet. You need a outfit overhaul before that big marathon ex'd out on your calendar. And Nike is here to help with its 26.2 Marathon Shop, filled with all the goodies you could ask for before you toe the line race day. With Nike sponsoring the Bank of America Chicago Marathon and the Nike Women's Marathon in San Francisco next month, most of the gear is specific to those races, but the site also features training essentials for any race--like any running shoe imaginable, even customizable ones, Sportbands and SportKits to track your pace and mileage, and gear for whatever weather is thrown your way. As for the race-specific gear, check out the hats, training tees and tanks for Chicago, plus the hoodies and tees for San Francisco. I won't even be close to recovered for the Nike Women's Marathon on October 18 but I wish I were just to sport a hoodie or fleece post-race. No complaints though as I'm equally in love with the Nike Map tee for my Chicago race on the 11th. The LunarGlide+ shoes. I'm already a fan of these on the run, but one model online is decked out in blue and I'm loving that even more than the neon orange with white combo. Dri-Fit Chicago Marathon Running T-shirt. The material is so soft on this one, I'd almost rather wear it to bed than take it out on the path. But it is great at wicking away the sweat and a perfect layer as the mornings cool off. WM '09 Fleece Hoodie. You'd probably catch me wearing this one even though I'm not running the race. I just love it and the design too much. Distance Long Airborne Tank Top. 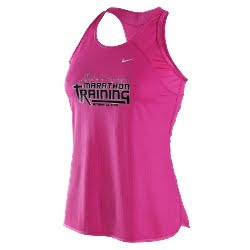 In a race top, I need pockets, I need sleeveless and I need something that doesn't bare my belly. This top has all three, plus I'm a fan of the blue. Race Day Boy Shorts. I don't know what it is, but I've had to retire my running shorts in favor running in my tri shorts. But if I can shed the padding and find a run-specific version like these boy shorts, I'm all for it. If it's cold however, I'll have to whip out my capris--something about the spandex and lack of chafing I tell 'ya.